This is an in circuit transistor (and FET and diode) tester that uses a 1 kHz AC square wave test signal. 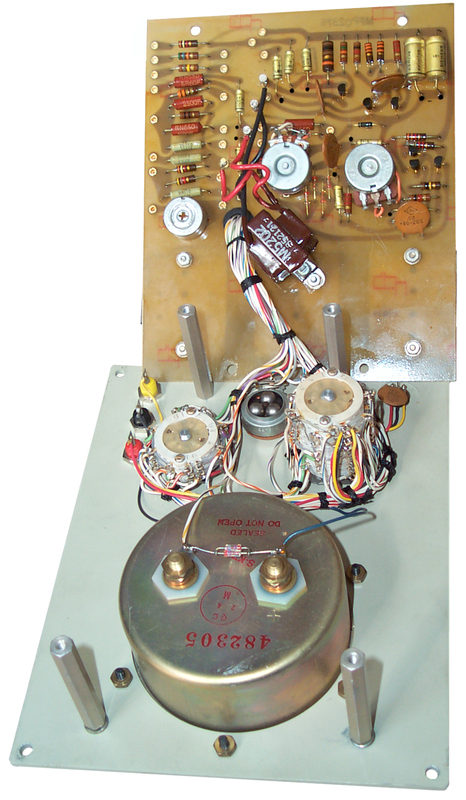 The patented test method made this a popular In-Circuit transistor test meter and it was made in versions A, B, C and D.
This unit is also labeled as an III model 350 In Circuit Transistor Tester. Although the DC battery check worked OK when this used instrument arrived when trying to measure the beta of a transistor, they all test as infinite beta (equivalent to no deflection of the meter (all the way to the left)). The Beta Cal function works as it should and the instrument passes the tests in the -14-3 manual. This may mean the beta is in the hundreds but when the transistor is removed from the socket it also reads infinite beta. I see this as a flaw in the design. 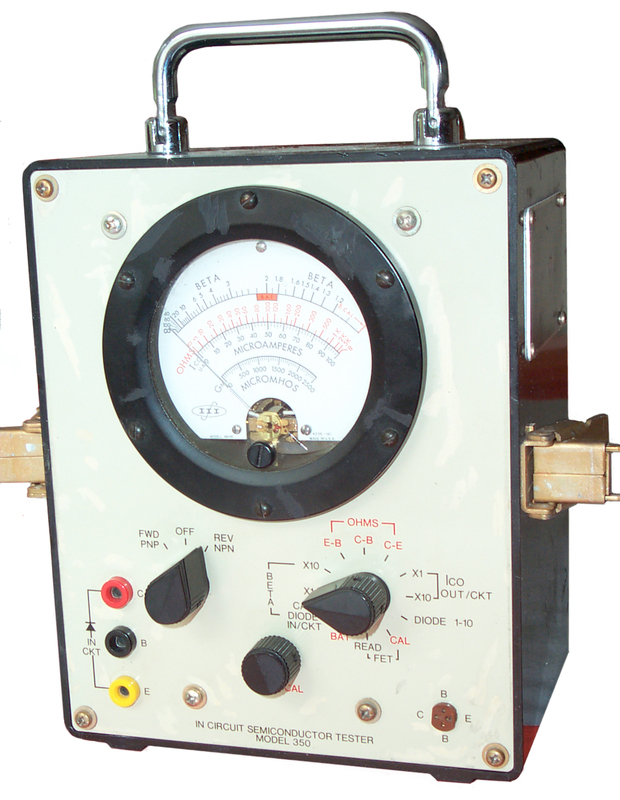 The tester may work used for In-circuit testing, but does not work for loose transistors. When DC stuff works and AC stuff does not then old electrolytic capacitors are suspect. In this case there are a number of high impedance caps that need to be replaced. After removing the 4 cover screws and the 4 screws on the rear PCB, the rear PCB can be hinged open allowing replacement of the caps. The photo at the left shows the stock meter, except I've put a black dot by the negative lead of all the electrolytic caps. It turns out that on the trace side of the PCB there are small "+" marks for each of the electrolytic caps. After replacing C5, C6, C7, C10, C11, C14 and C15 (all with 22 uF 25 V) the meter is still not working correctly. The beta zero works but not the beta test on a loose transistor. If you have an idea of what's goint on, please let me know. During the troubleshooting process I made a copy of the overall schematic and set the switches for Beta X10 and NPN then erased all non connected paths. The resulting diagram is considerably different from Fig 5-2 in the 14-3 TM. In particular Fig 5-2 shows emitter DC bias being a 3k9 resistor to +6 volts, but there is not DC connection between the transistor the battery ground. There is a DC voltage of 2.8 Volts between all three transistor terminals and battery ground, but not bias. This measurement is consistent with the overall schematic diagram. 3287643 Method and Apparatus for Measuring the Beta Parameter of an In-Circuit Transistor without the Application of D.C. Biasing Thereto Nov. 22, 1966 B. Reich (AEL) 324/768 - In-Circuit test in a way that won't damage the transistor and that will work in spite of the surrounding circuit. The transistor is operated as a common base amplifier with the emitter driven by an ac coupled square wave. This causes the collector to self bias by rectifying the emitter signal and thus produce a DC current. 3440530 Method and Aparatus for Measuring the Resistance of an Electrical Component which may be Shunted by a Semiconductor Device April 22, 1969, B. Reich 324/713 - the idea is that small signals do not turn on semiconductors. page created 16 April 2006.